Hilton HHonors is the only hotel loyalty program that I know of which allows the member to earn both hotel loyalty program points and airline miles for the same stay. Hilton HHonors calls this “Double Dip”. 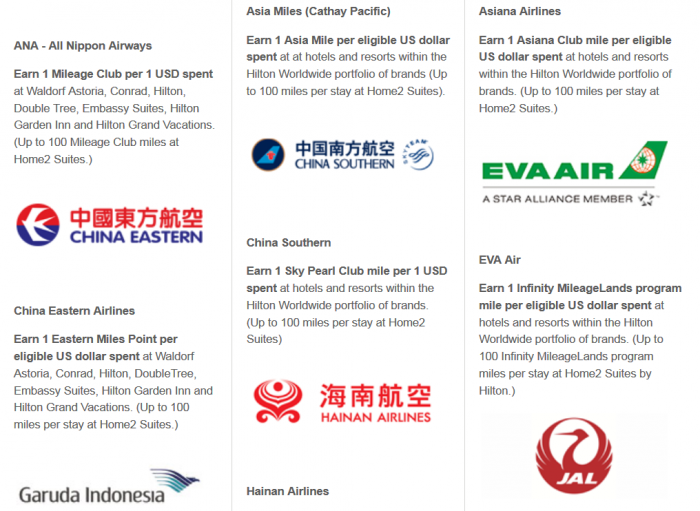 To earn airline miles you have to forgo earning an additional 5 Hilton HHonors points per dollar spent. This does not affect the base earnings of 10 Hilton HHonors points that everyone will earn regardless. You can access your Hilton HHonors account here. Should my Double Dip earning option be Points + Points or Points + Miles? 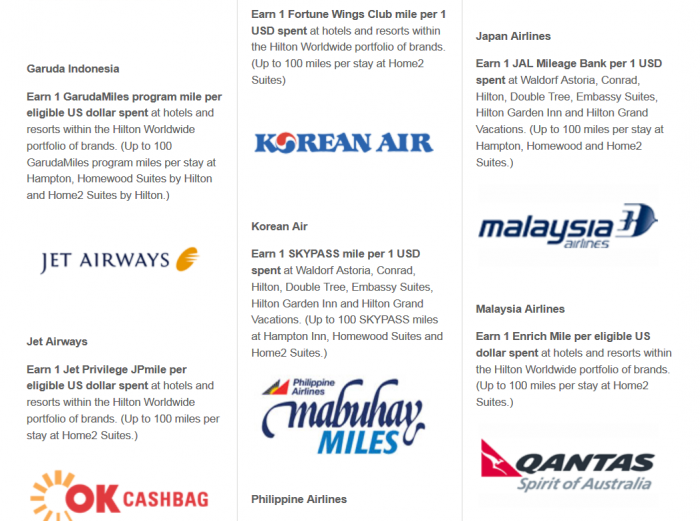 I believe that five Hilton HHonors points are more valuable than one airline mile that members usually earn per dollar spent. 1. There is a promotion to earn double/triple/quadruple or fixed miles bonus for your stays. These are prevalent with Asia and some Europe based airlines. 2. You need to top up your airline frequent flier account. 3. This is a good way to have some activity in your airline account and not let those miles expire. 4. An airline has a promo going on for partner transactions. As you can see there are some partners that give by default more than 1 mile per USD spent: AeroMexico, LAN (LATAM Pass), Iberia, Virgin Atlantic, Virgin Australia and AirAsia. There are partners such as JetBlue and Virgin America that earn less than 1 mile per USD spent. You do have to keep in mind, however, that airlines have different award charts and sometimes earning 1 miles can be more valuable than 2. Members may only accrue up to 10,000 airline miles per stay (or the equivalent currency of the airline Marketing Partner), except with respect to Home2 Suites by Hilton which limits accrual to 100 airlines miles per stay (or the equivalent currency of the airline Marketing Partner) and except with respect to the following airline carriers: Aeromexico – up to 20,000 kilometers; AIR MILES Canada – up to 1,000 reward miles; El Al Israel Airlines – up to 250 airline Points; Iberia – up to 1,000 airline Points; LAN – up to 20,000 kilometers; Virgin Atlantic Airways – up to 20,000 miles; and Air New Zealand- up to 30,000 Airpoints dollars. The number of airline miles that one can earn for a stay are capped at 10,000. Usually this wouldn’t be a problem (requires $10K stay) but when there are these bonus promotions the actual dollar figure can be a lot lower. Also, Iberia Plus members can only earn up to 1,000 Avios per stay, that is NOT a lot considering that they sometimes have promotions for up to quadruple miles (stay more than $250 would exceed the limit). Hilton HHonors has made it very difficult to change the earning preferences and actually find the list of partner programs and their current earning rates (access the latter here). You first need to log into your account (do it here) and then you need to choose “GO TO MY ACCOUNT PAGE” (access here). Here you can change the preferred partner where you want the miles go, add a partner or delete one. How to switch between partners and earning options? It doesn’t matter what preference you have on file Hilton HHonors ON the night that you stay at the hotel. It matters what you have on file on the day of check out. This works as long as the hotel uses OnQ or Opera that transfers the check out data back to Hilton HHonors every night. Keeping this in mind you can switch between different earning styles and partners as often as required. 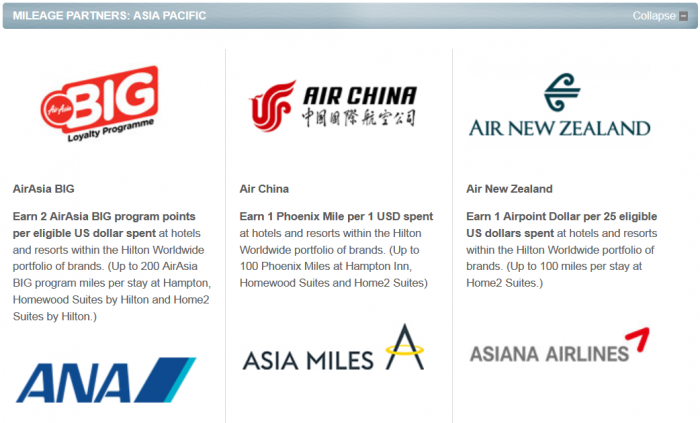 Hilton HHonors has made it very difficult to find this earning option (the default is Points + Points), although most would benefit of earning airline miles at the same time when there is partner promo running. This year (early 2016) I have been crediting the miles to Singapore Airlines KrisFlyer due to their double & triple miles promotions. I just now (May 2016) changed the earning preference to Iberia Plus Avios to earn double/triple/quadruple Avios for my stays until the end of August. Remember that you can sign up for the global promotion for bonus points and separate airline related offers at the same time and earn both bonus points and miles for the same stay. This way you can really boost your point and miles earnings at the same time. We cover all Hilton HHonors promotions (access here) and all Hilton related posts including promotions (access here).